MIT students, faculty, and staff were recognized for their various contributions to the MIT community at the 2001 Awards Convocation, held yesterday in 10-250. 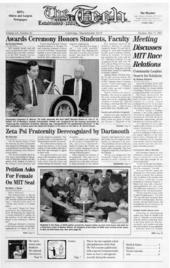 The Psi Epsilon chapter of Zeta Psi fraternity has been permanently derecognized by Dartmouth College as punishment for publishing three internal newsletters with offensive sexual content. Over 600 members of the Class of 2003 received their class rings and celebrated the halfway point of their undergraduate careers aboard the class’s ring cruise Saturday night. My impression was that it was all made up, that the newsletters were internal and not supposed to be released outside of the fraternity. If those things are true, then it will be neither the first nor the last case of an institution cracking down unfairly on fraternities for views and opinions that they’ve expressed.